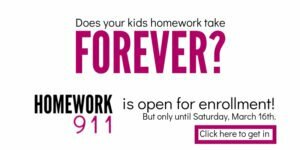 Does it seem like your child has a lot more homework than you did at her age? The vocabulary, the spelling, the math homework sheet and then the required 20 minutes of reading… all in first grade?? How can you possibly keep your child focused during it all? Before you go further, if you have a nagging feeling that your child may have way TOO much homework, I’ve made a short e-book with action steps that you can take as a parent. It will rundown how to tell if your kid brings home too much homework for her age and what you can do about it. 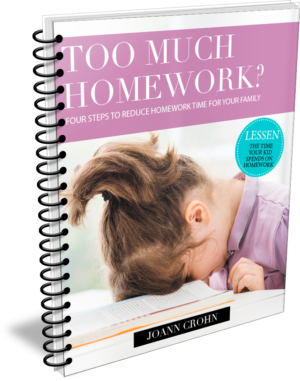 GET your TOO Much Homework e-book here. Now, assuming your child has a reasonable amount of homework for her age, these homework tips for kids will help her focus so that she can complete her assignments in the shortest time possible. As humans, we all struggle with focus. Right now, as I try to write this in a middle of a Starbucks, I’m tempted to stop in the middle of this sentence and check my Facebook feed. … or I think I just heard my phone ding. … oh, wait, did my husband feed the dogs this morning? I better check on that. But, WHY? Why do we do this? When we have so much more to gain by concentrating on the task at hand so we can just finish?? Kind of like our kids, right? They could spend so much less time on homework if they would simply focus. The point is that focus is hard! Our brain seeks novelty and when we’re engaged in the middle of a task, our brain desperately searches for an escape. An excuse just to break the monontony. Not on my watch, brain! So, the trick comes in being wittier than our brain. We can do this for ourselves as well as our kids. Everything your kid sees will literally distract them when they are in the middle of a monotonous task. EVERYTHING. This is why many teachers use the cardboard dividers between students while taking tests. Because wherever the brain sees novelty, it’s going to clench on with it’s two chubby fists and not release until everything is covered in drool. How do limit distractions in a busy house though? If your child has trouble concentrating, designate a safe homework place. Perhaps its in another room or maybe its a specific time where the entire family agrees to leave all other distractions off. However, maybe your kid’s mind simply wanders. If so, they need something they can tune out so they can in fact tune in. Have you heard of the “Mozart effect,” where listening to music boosts brain power? Researchers found that the effect of music on your performance depends entirely on the type of task. If kids are completing a math worksheet or a reading comprehension assignment, music will hinder performance. However, if they’re engaged in any sort of creative project such as creative writing or building, music may help maximize their productivity. While we can’t control how much homework we have to do, we can control the amount of time we choose to do it in. A timer can work wonders – especially if your child finds it hard to concentrate for any length of time. Start by telling your child that you’ll set a timer for 5 minutes. All he needs to do is work for 5 straight minutes before he can take a break. And if he can’t yet do 5, set the timer for 2 minutes instead. The goal is to master focused work for a set period of time and train the brain to work for longer focused periods. The type of rest kids take between work breaks is just as important as the actual work. While we love to relax by playing games on electronic devices, they aren’t exactly restorative. Instead of clearing of the mind, they agitate and stress. The best rest is active – I know, call me crazy on that one but hear me out. Some of the best and most productive people in the world believe in active rest breaks. Research shows that movement breaks are essential for physical and emotional health. In fact, breaks are even more effective if taken out in nature. So, encourage your child to take their break outside. They can ride a bike or simply putz around the backyard. When we purposefully engage in a task – not only are we more motivated to complete it, but we are also happier. Have kids set a goal for homework time. What are they trying to master? What do they want to accomplish? Get an A on their spelling test this Friday? Help them define the why and see how it affects their motivation and focus. Some kids absolutely love homework while others struggle to complete it with any enthusiasm. 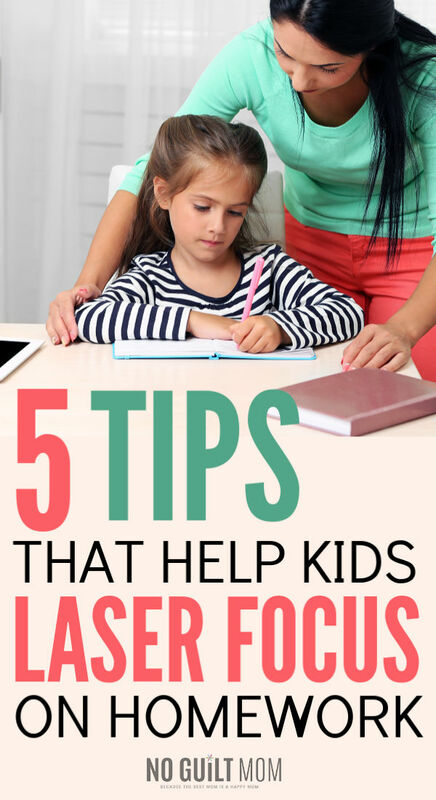 By using these homework tips of setting a goal, using a timer, removing distractions and taking active rest breaks, you’re doing your best to encourage focus in your kids. And if you fear that the homework load is way too much, grab my guide see how you can remedy it!